As an entrepreneur and restaurant owner with over 15 years in business, I feel I can identify what the most important skills and qualities are in order to be successful. I recently saw this question on a forum: “Is having a degree necessary for an aspiring entrepreneur?” There were instantly hundreds of comments on this post. Most people said no, it’s not necessary. Some people said it doesn’t hurt, or it is useful but not necessary at all. Information is easily available in this modern age. A college degree is great for certain aspects of a business. First of all, people don’t decide they want to eat at my restaurant based on my degree. I have a culinary degree and a good portion of a business degree. I took some classes because I was interested in business. Nobody has ever come to my restaurant based on where I’ve gone to school. A degree is great to have, but there can be downfalls. It can be hard to get a return on investment with a college degree, so pick wisely where you go to school. I have a lot of friends who went to big-name culinary schools with a big price tag. From time to time I even get asked if I went to one of these big-name schools — but this is after they have already had an amazing meal at my restaurant. So, here is my answer to these people: “Yes, I’ve gone to that culinary school … for lunch once and it was pretty good!” This gets a big laugh from everyone. My friends who went to these culinary schools spent $50,000–80,000 on a two-year degree. When I had to make that decision, I asked myself, “What is my return on investment?” The reality is, after finishing school, we were all headed to work for the same $8 an hour wage. Sure, these iconic culinary schools had better resources. But better resources don’t always make you a better student or a better chef, and they don’t make you more successful. Degrees are required in certain fields. For example, to be an attorney or a doctor you do need a degree. Business is not necessarily a field you need a degree for. It’s the same with the culinary field. 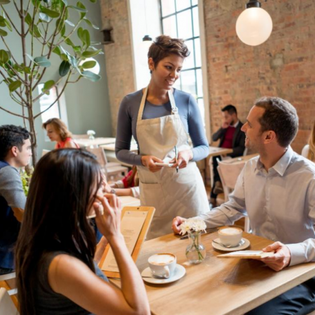 In fact, the most successful restaurateurs out there don’t have a degree in culinary arts or business, but they’ve learned the necessary skills somewhere else along the way. When I was a young chef apprentice, I received advice that I give to this day. My first chef mentor told me, “If you go and work in a five-star hotel or restaurant and receive a recommendation letter from the chef, that will be more valuable than any degree.” I took that advice and it made a difference. I ended up working for two amazing properties in the U.S. and a Michelin three-star in Europe. Everyone I interviewed with after was impressed that I had worked in these operations. They really didn’t care what I did there. It was the mere fact of the association with the property and seeing a letter of recommendation. My culinary degree was never a part of the equation. In fact, I never even got a copy of my degree when I graduated. And no employer ever asked to see it. Student loans are big business in the U.S. Loan providers are there to make money. So, they have to create a demand for their product. Colleges and universities are fantastic marketers. They’ve created a need for their product, which is a degree and certain fields require that degree. So, when you go to look at colleges, it is like walking in to buy a car. You are being sold on certain aspects like the campus, future job market, demographics, etc. The better anyone can sell their product, the more they can charge you and say their degree is more valuable. So keep that in mind. Please understand that I’m not saying don’t get an education. I’m saying a formal education may not be your golden ticket to success. And for some, paying back the loan can lead to years of financial stress. Many factors create a successful entrepreneur. My personal strategy was to get a degree that wouldn’t create a financial hardship on myself or family. Then I combined it with on-the-job experience. Do what’s best for you, but be open to all your options.